“You’re a vapid, unfunny, pale shade of a hero. You’re unintelligent, uncreative, and unremarkable in every way. You don’t seem to do anything well expect heal yourself and appear EVERYWHERE! I don’t understand your APPEAL!” – President Abraham Lincoln to Deadpool. Agent Ben agrees with the 16th President. Agent Daniel holds the opposite opinion, loving the humor and excessive gunfire. There are a lot of stories that Deadpool haters may never see as being their taste. But seriously who would not want to see Deadpool battle the zombie Presidents of the United States? In Deadpool: Dead Presidents a misguided necromancer has determined the formula to save America, raise all the deceased Presidents from the grave and let them reshape America. Too bad the zombie Presidents are bent on destroying the United States of America! S.H.I.E.L.D. realizes having an Avenger take down these historical icons would be a public relations nightmare. So they call on Deadpool to hunt down and kill the zombie chiefs of state. And as it should be, he is advised by the ghost of Benjamin Franklin! The story follows Deadpool as he hunts down presidents; including fighting President Reagan in space and boxing President Lincoln. Can Deadpool stop President Washington from raising an undead army to conquer the nation’s capital? Will Washington conquer Washington? 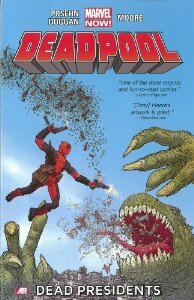 Written by Gerry Duggan and Brian Posehn, Deadpool: Dead Presidents is quirky, weird, action packed, and fun. It also struck me as brave. It is the only comic I have ever seen with the guts to raise relatively recently deceased former Presidents and make them zombies. And then Deadpool kills them. Honestly, it is either really brave or really unsettling. But then Deadpool is Canadian so it does make sense he would try to kill our zombie Presidents instead of giving them the respect they deserve! On the S.H.I.E.L.D. side of things we see some different agents. Preston, Gorman and Adsit are far from the super agents poster children. As a group they are balding, overweight and far from pretty. Yes, there are regular folks employed by S.H.I.E.L.D. There is hope for me! I wish I could tell you there is some deep lesson here in Deadpool: Dead Presidents. But that is far from the point. This is a romp, where Deadpool plays out our childhood fantasies of chasing zombies across America. But in this case they are historical figures, and President Carter who insists he is not dead yet! Deadpool: Dead Presidents is not for everyone. It is mindless popcorn with a twist. Agent Ben will not be impressed. But for me it made me chuckle while I watched Deadpool abuse American history. You know the more I described this to a friend, the more awesome this story became. Maybe Duggan and Posehn have found a gimmicky Deadpool story that is awesome surely because of how insane it is!